For those of you tracking the many purposes a weblog can serve, you can now add house building to the list. 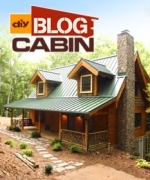 DIY Network will air a new show August 16 at 9PM called Blog Cabin which will document the building of a log cabin which was built with guidance from bloggers contributing a DIY Network weblog over the course of several months. From roof style to window selection to fireplace, bloggers logged over 4 million suggestions and votes during the project. They even alerted the apparently forgetful building crew a window had not yet been installed. Check out the entire project here. Why did you let that woman paint a fake fug on that beautiful hardwood floor? What's wrong with the beauty of a plain, natural finish? ARGH!!! All I think about is the headache it would cause . into the living room , and think about the winter. the driveway for bad weather . That would be a big reason why I wouldn't buy a lot like that even if it was a bargin . I LOVE your cabin!! If it's true that a lucky viewer may win this dream home? I pray it can be me. I am recently widowed, and have worked my entire life working with the elderly,however I have recently applied for fostercare to homeless and under priveledged children the one thing that is holding me back is my one bedroom apartment. What a beautiful place to raise children and to give them the mountains along with nature,So they too can understand the good in the world. I truly believe this would be a dream come true for ALL concerned. I would have no problem relocating. I just love to help others. Thank-you for your consideration. My husband and I watched the show and thought the cabin was great however I do agree that the painted rug was a little much. Anyone who wins this cabin will certainly enjoy it. Own a terrific cabin site on Alvado Lake (two hour drive north from Santa Fe) in mountains of northern New Mexico. Anybody out their who can help me get started? Or maybe I should sell this exquisite property? I am 68 years young and this has always been my dream retirement...comments welcome.